When RoastLog launched at the SCAA show in Anaheim in April 2010, we had a cupping module. No doubt, recording data and keeping detailed records on how you roast is important for several reasons. One of the most important is that you can produce better tasting coffee. At the time, we thought we had a design which was pretty slick. Go to a page for a particular roast and see all of the cupping notes for that individual roast, define custom cupping forms, compare different roasts and their cupping scores, etc. Neato! However, what we found was that nobody used it. A few folks poked at it, but nobody was really using it in a serious way. When the time came for us to do a UI and database overhaul to support our inventory system, we ripped out the cupping component. It was clear that what we built wasn’t quite right. Our intent was to put it back in eventually, once we had a clearer idea of what the feature should look like and do. A few weeks ago Linsey went out of town for week, so Ryan and I sat down together and did a Cupping Hackathon over the course of three days. 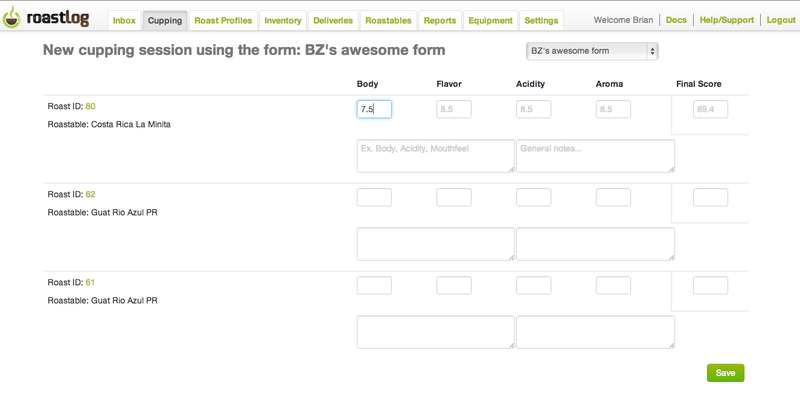 In only three days of focused effort, we cranked out a usable cupping module. I’m excited to say that as of yesterday, we’ve pushed this to our live site and cupping is back! What does our cupping module consist of? Since we are constantly coming up with additional ideas for enhancing this module, we’ve built the original to be easily and quickly iterated and improved. The cupping module we offer now is designed much better than before. We look forward to seeing how it is used and to hearing our users’ feedback and suggestions. it would be really useful to have the final score tallied up automatically after all the scores are added, based on the defined fields, rather than having to add and enter them manually. You’re the 2nd person to ask for that. We built it this way because every person we talked to filled in the score manually, then went and back-filled the other parts of the form. From our “research” most folks don’t cup the “standard” way where individual column scores total up to a final score. Having said all of that, we’re looking into a way where a form can work in either mode since that feature is (obviously) useful.